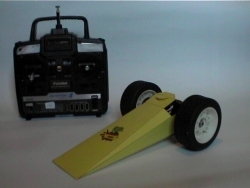 Providing you already have a set of Radio control, then this is a cheap and ideal ‘introduction to competitive robotics’ event for secondary schools or after school clubs. 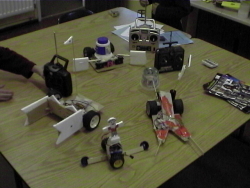 In about 1 ½ hours groups of about 8 can make a miniature ‘Robot Wars’ style combat robot. The bodies are made of folded card, and the wheels are from Lego. 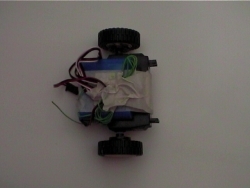 To make the radio controlled drive and steering the children need to learn how to ‘hack a servo’. 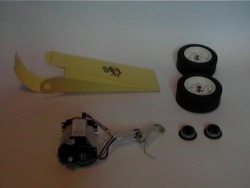 Normal hobby servos are used for positioning rudders etc on model boats and aeroplanes, but by dismantling them and modifying the insides, they can be converted into variable speed motors. 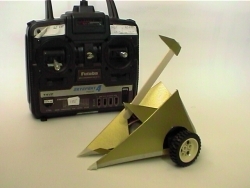 Older students can use additional micro servos to add weaponry such as axes and flippers, or devise their own body nets to recreate their favourite bot. If you make two different versions then you can explore the effect of gearing (wheel size) by comparing performance in sumo, manoeuvrability and sprint competitions.